Conductive double sided adhesive carbon-tabs. 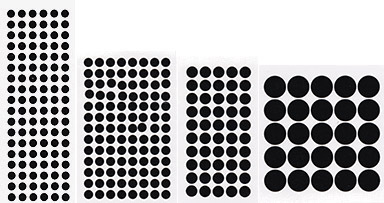 The high purity double sided conductive adhesive carbon tabs and tapes are especially developed for SEM / EDS applications. The material used for both the tabs and tapes is fully transparent for EDS with only trace amounts of Al and Si. The material is constructed using a non-woven liner coated on both sides with a conductive, carbon filled pressure sensitive acrylic adhesive. Total thickness of the material is approximately 150µm with an adhesive thickness of 45µm on both sides. The adhesive used has a high adhesion strength to metals, plastics, ceramics, wafers, rubber, wood, glass, paper, and small particles or fibers. 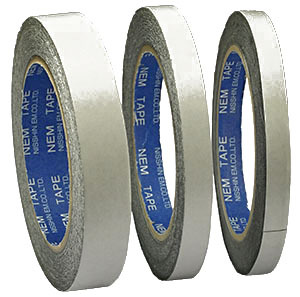 The conductivity of the carbon tapes and tabs is lower than the conductivity of double sided copper tape or the double sided conductive Lift-N-Press tabs, but it is still fully compatible with SEM/EDS applications. The EM-Tec high purity conductive double sided adhesive carbon tabs are supplied on a clear plastic sheet with a white plastic liner tab. Available as Ø6mm, Ø9mm Ø12mm and Ø25mm carbon tabs. To use: lift the tab of the clear backing sheet, press the sticky surface to the mount, then peel away the white liner tab, leaving the adhesive exposed. Mount sample on the exposed adhesive. Alternatively, the white liner tab can be removed, the stub pressed on the exposed carbon tab and the clear plastic lifted off. The use of sharp pointed tweezers helps to lift of the tabs and liner. The carbon tabs can be easily removed with isopropanol, ethyl acetate, ethanol or acetone. The Ø25mm carbon tabs are compatible with Ø25.4mm pin stubs, Ø25mm JEOL stubs and Ø25mm Hitachi stubs. High purity conductive double sided adhesive carbon tapes: The material is identical to the material used for the tabs with one difference; the tapes are self-wound with a thin white liner on one side of the tape. The tape can be shaped into custom forms, strips and cut-outs. Available in 5mm, 8mm, 12mm and 20mm width by 20m long. To use: Cut the required length of carbon tape from the roll and cut to shape if needed (care since one side has exposed adhesive). Adhere tape to the sample support. Remove the top liner and adhere sample to the tape. The use of sharp pointed tweezers helps to lift the liner of the adhesive. The carbon tape can be removed with isopropanol, ethyl acetate, ethanol or acetone. Made from the same material as the high purity carbon tabs and tapes, the conductive double sided adhesive carbon sheets are ideal for cutting to size as required. 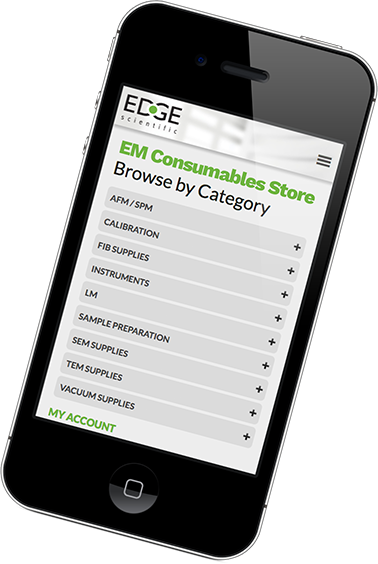 This products is mainly devised for SEM / EDS applications. The material exhibits low outgassing and allows larger areas covering to adhere samples. Sheet size is 54 x 125mm with a thickness of 0.15mm; sold in packs of 10 sheets.